Professional competitions. League events. Local shoots. Stay connected with Free Fan Alerts and DCTV. Receive notifications whenever your favorite players are ready to play with a link to their LIVE scoreboard. 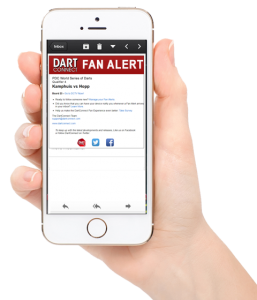 Log into the Fan Alert Page with your DartConnect account or register now. If you do not have one, create one in less than two minutes. Note: A free guest account is required to receive Fan Alerts via email. A Premium membership is required for text message notifications (update your profile to switch from email to text). After logging in with your guest account or paid membership, select your favorite players. Over 6000 players available to follow! Use the Event Menu on DCTV to see a list of event participants. 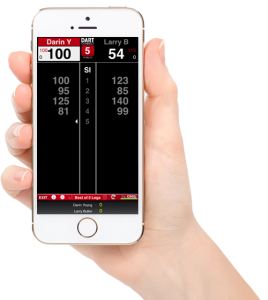 Every time a player is ready to compete, you’ll receive a Fan Alert with a link to the LIVE scoreboard on DartConnect TV. Change a player you are following by using the cancel icon and selecting a new darter. You can follow the entire event on DCTV with live scoreboards, leaderboards, brackets, board calls, results and more. Try it on your mobile phone and share with your friends! Guest Members can currently only receive notifications via email. Who are the players that I can follow? What tournaments apply? 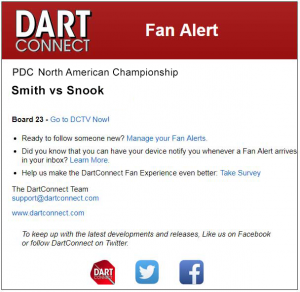 Please note, only tournaments that feature DartConnect scorekeeping and event services are available for Fan Alerts. See the event list on DCTV for upcoming events. Do I need to be a DartConnect member to watch DCTV? DCTV is a completely free service with no membership required. Free Fan Alerts require a membership because a profile including recipient contact information is necessary. How many players can I follow? You can follow up to 4 players simultaneously and swap them out at any time. What do the Fan Alert notifications look like?